Steve Hackett | Live At Liverpool Box Set in the pipeline. A cold Friday evening in Newcastle was a good reason to sit inside a warm Newcastle City Hall and watch one of prog’s leading and legendary bands Yes. Like other such bands of their generation they have recently suffered a huge loss in their ground braking bassist Chris Squire. It was humbling therefore to witness a respectful tribute in the form of Onwards a lilting song played via the p.a. before the band graced the stage. 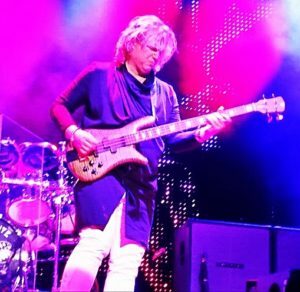 Humbling too was the presence of Chris Squire’s Rickenbacker bass subtly spotlit until the song finished to tumultuous applause. The show was split into two halves the first half being the performance of the band’s 1980 album Drama. At this point i have to confess that Drama is without doubt my least favourite Yes album and to this day i still confess to thinking Drama as the best album The Buggles never made. As the band tooled up for the job in hand launching headlong into Machine Messiah i was reminded why, the songs are so removed from the traditional Yes style that i found myself struggling to get with the vibe. However, the songs were played with new impetus and a zest to be admired. Of the Drama set i enjoyed I am A Camera and Tempus Fugit by far despite the dreadful muting of the drums (from my seat anyway!) no doubt due to the perspex screens erected around Alan White’s drum kit. This i found robbed the overall sound of a little excitement. Closing the set was an equally moving tribute to the late Peter Banks as the band played a beautiful rendition of their classic Time And A Word. Jon Davison’s voice was the best it sounded all night whilst singing this Yes standard and i was moved by the passion and intensity in his delivery. 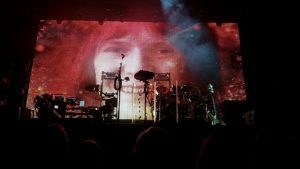 After a twenty minute break counted down on the huge pixel screen behind the band Fragile was given a 2016 make over and i was eager to see and hear how this incarnation of Yes would handle my favourite Yes album. Getting the ball rolling with Roundabout was always going to be a winner and it was played with gusto. Geoff Downes excelled himself with the Fragile songs though some of the more eclectic sequences left me a little flat. Geoff Downes keyboard sounds were a little out of kilter for his single handed attempt at the multi layered Cans And Brahms which in hindsight would have been better rearranged for the live performance. Harmonies on songs like South Side Of The Sky were very good though it was the area of the Yes sound suffered the most from the lack of Chris Squire. Of the songs in the Fragile set it was Long Distance Runaround and Heart Of The Sunrise that got the biggest thumbs up from me. Billy Sherwood had a very difficult task to perform with some massive shoes to step into. This was evident whilst playing The Fish a Chris Squire standard. Billy Sherwood’s performance here and throughout the whole show was without doubt outstanding, respectful and melodic. 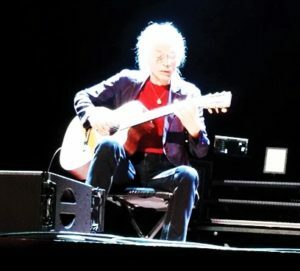 Steve Howe’s acoustic guitar playing during Mood For A Day was as ever stunning, a master class in guitar playing. Returning to the stage for three encores Yes played a song which made me want to revisit their album Tormato. Don’t Kill The Whale really gripped my attention and found the band playing with what appeared to be a little more enthusiasm whilst Owner Of A Lonely Hear had the younger Yes fans dancing in the aisle. Starship Trooper was a stroke of genius though as a finisher and it went down a storm. 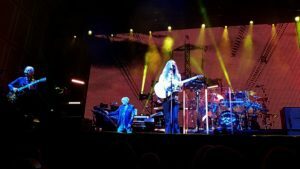 A great evening though i didn’t have the fire in my belly as i have with previous Yes performances. I fear they may have veered a little too far away from who they were to do the music justice and the dilution is having more of an effect as time goes on. An enjoyable evening though i me have to think long and hard before i bought tickets for any future outings.